Officially known as the People’s Republic of Bangladesh, the country is located in South Asia. Although near Bhutan, China, and Nepal, it only shares borders with India and Myanmar. It is the world’s 8th most populous countryThe country features 5,000 miles (8,046 km) of waterways. It is a country rich in natural and cultural wonders. Baklai Falls, although debated, is considered the tallest waterfall in Bangladesh. It reaches a height of 380 feet (115 m). Baklai Fall is located near the village of Baklai, which is where the name of the falls comes from. Baklai Falls is actually comprised of a number of tiers of falls. Much of the rocky area is covered in moss throughout the year adding to the green aesthetics of the falls. The Bengal Delta, also known as the Ganges-Brahmaputra Delta, the Brahmaputra Delta, and the Sunderbans Delta, is the largest delta on earth. This river delta empties into the Bay of Bengal and because of the consistent presence of water, is considered one of the most fertile regions of the world. The Bengal Delta covers more than 41,000 square miles (105,000 sq. km) and is fed from rivers in Bhutan, Tibet, India, Nepal, and of course Bangladesh. Wildlife includes the clouded leopard, Bengal tigers, the Indian python, and numerous birds. Cox’s Bazar Beach is one of the largest uninterrupted natural sandy beaches throughout the world. It stretches over 74 miles (120 km) in length. It is the leading attraction for the country of Bangladesh. Cox’s Bazar Beach is created by the water of the Bay-of-Bengal. It is an attraction and wonder that is best experienced with a walk along the shore. Jatiya Sangsad Bhaban, also known as the National Parliament House, is one of the largest legislative complexes in the world. The complex covers 200 acres (800,000 sq m). It is recognized as one of the 20th century’s most significant buildings. The Parliament Chamber can hold up to 354 members during session. The main building features nine individual blocks, with the 8 peripheral blocks reaching a height of 110 feet and the central block reaching a height of 155 feet. 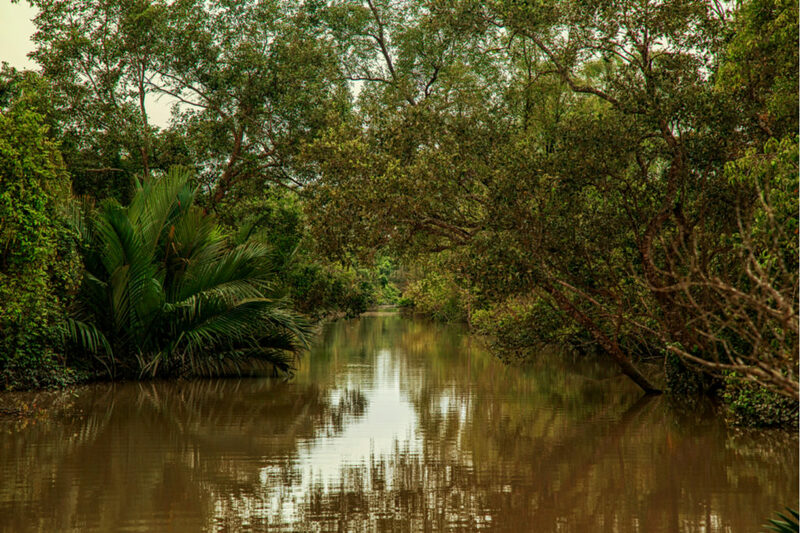 The Sundarbans is a network of marine streams, mud shores, and mangrove forests. It is known as the largest mangrove forest in the world. Sixty percent of the Sundarbans mangrove forest lies in Bangladesh with 40% laying in India. The Sundarbans are home to the Bengal tiger, chital, crocodile, snakes, and an abundance of reptiles and birds. The mangrove forest measures 6,400 square miles (16,700 sq. km). The floor of the Sundarbans varies in height ranging from 3 to 6.9 feet (0.9 to 2.11 m) above sea level.